Whether he's entertaining thousands of audience members at Carnival City or just a handful at a corporate function, André's shows are always mesmerising and hilarious. The award-winning hypnotist's shows are suitable for all ages, providing the perfect night out for everyone. Despite his busy schedule, André managed to find time to answer a few of our questions. 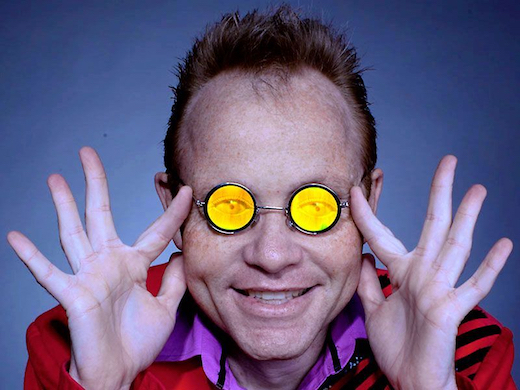 Gigster Online (GO): Who is André the Hilarious Hypnotist? André The Hilarious Hypnotist (AHH): "André The Hilarious Hypnotist is a full time professional entertainer who earns a living by hypnotising people and then getting them to participate in a series of Hilarious hypnotic antics on stage." AHH: "I have an avid passion for seahorses and cave exploration. If I am not on tour, I am normally in one of the myriad cave systems not open to the public, littering the South African underground." GO: At what age did your interest in hypnosis start and how did you get involved with it? AHH: "My interest in the Theatre and the Theatre industry started when I was very young but at the time I believed I would be a magician or something in a similar vein. It was only in 1998, after seeing the late Max Collie performing that I knew I had officially found my calling." GO: Who is your biggest inspiration in the world of stage hypnosis? AHH: "My mentor and teacher, the late Max Collie, was my inspiration and watching him in action on DVD still has me in stitches of laughter." GO: What would your advice be to anyone wanting to follow in your footsteps? AHH: "Entertainment is not an easy career. It takes dedication, perseverance and belief. Keep on doing what you are good at, but work hard at it. Your mentor will cross your path." GO: If not for your career in hypnosis, what would you be doing now? AHH: "I would have been a Teacher specialising in Geography and Guidance Counselling." GO: Having entertained thousands of people both locally and overseas, at schools, fundraisers, corporate functions, year-end parties and other formal events, what has been your most memorable experience? AHH: "I think the most memorable moments of my career were definitely my two television series on Kyknet which ran for 14 episodes and of course, my biggest performance to a live audience of 3000 paid people." GO: How do you adapt your shows to suit audiences in their thousands, as well as smaller groups at corporate functions? AHH: "One has to learn to adapt. It can be as difficult to perform to 30 people as it could be to 3000. The only way to achieve success is to know the business, be able to read the audience and adjust the performance to suit the size and makeup of your specific audience. " GO: For someone who has never been to one of your shows and is nervous about being hypnotized, what would you tell them to set them at ease? AHH: "Although the show is a hypnosis show, people are not forced to volunteer. I never hypnotise people without their permission and there are always more than enough people ready to take to the stage and to become the stars of the evening's entertainment. If you are coming to see a show purely because you would like to have a good time, you will be completely safe as I do not pick on any single person during the performance." GO: How long have you been using Gigster's online booking platform? AHH: "I have been with Gigster for approximately one year." GO: What is it about Gigster's online booking platform that appeals to you? AHH: "Gigster provides an easy platform for an artist to quote on a show without the involvement of a third party. Gigster in essence removed the middle man or does the work of the middle man on my behalf. I am also able to respond to a client's request at a much faster speed." AHH: "Next stop England and America, or at least that is my current aim." With his wonderful, dry sense of humour and adaptable, family-friendly shows, we're sure he will be turning audience members into the "Lone Ranger riding a pool noodle" (or some similar, strange scene) for many years to come.